One of the most important Jain tales, the Story of Śālibhadra has enjoyed wide circulation among Śvetāmbara Jains in Gujarat and Rajasthan. It has been passed down through the centuries in the main languages Śvetāmbaras have used, namely Prakrit, Sanskrit and Gujarati. It is a good representative of religious teaching in narrative form - dharma-kathā. Its significance comes from the restaging of the key concept of giving alms to monks - dāna - which is one of the fundamental duties and daily activities of Jain followers. Like almost all Jain stories, it illustrates the working of karma and rebirth and shows how the main protagonists ultimately become Jain monks before, in the end, attaining final liberation. The mendicants in this tale also illustrate the practice of fasting unto death, for which Jain monks have become famous. Early versions of the tale tend to revolve around certain episodes that emphasise individual religious topics, such as offering alms or fasting to death. Fully developed versions of the story are very eventful and popular. One of the highlights of JAINpedia, the manuscript digitised on the website is the Gujarati version composed by the Śvetāmbara poet Matisāra in the 17th century. In verse and based on musical modes, Matisāra's account is well known and copies are reasonably common. This manuscript, executed in Jaisalmer, Rajasthan, has some noteworthy features. It is clearly dated and gives the name of the painter who has skilfully illustrated numerous episodes of the story, which can thus be easily followed in both the texts and images. Rich visuals feature in many versions of the story, with several illustrated manuscripts surviving, all created in Śvetāmbara circles. The artistic tradition surrounding this tale is very varied in style, free of conventions seen in other Jain art and frequently demonstrating sectarian associations. The history of Śālibhadra is a favourite of the Śvetāmbara Sthānaka-vāsins, who reject temples and the worship of images, neither of which are mentioned in the story. However, the JAINpedia manuscript can be identified as having been produced by Mūrti-pūjaka or image-worshipping Jains. In addition, its colophon underlines one of the main characteristics of painted manuscripts of this tale. This is that the story of Śālibhadra is often performed, with music, among Jains of the diaspora in particular. The tale of Śālibhadra tells of a very wealthy young man who abandons all his possessions and comforts to turn to monastic life, marked by hardships. Turning one's back on a worldly fortune is highly meritorious among Jains, who have coined the phrase ‘rich like Shalibhadra’ to describe someone who is extremely affluent. The main theme of the work is the giving of alms to mendicants, which is one of the duties of lay Jains and brings merit - puṇya. The laity's donating to ascetics helps bind together the four parts of the Jain community and is thus an important act both spiritually and practically. In Jain treatises on lay conduct, such as the 14th-century Śrāddhavidhi by Ratnaśekhara-sūri, Śālibhadra is mentioned as the exemplary figure with regard to offering food to mendicants. In the tale's two episodes featuring alms-giving, the emphasis is not so much on the thing given as on the spontaneity of the act of giving and the feeling of deep joy it produces. Known in several versions, the story offers differences in details. Here is an outline of the main stages. 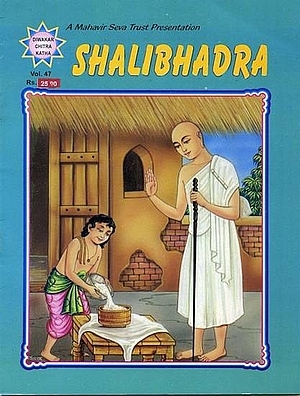 This cover from a contemporary comic book shows young Sangama donating his milk-rice to a Śvetāmbara Jain monk. The monk wears the traditional monastic robe, carries the monastic staff - daṇḍa - and makes the gesture of dharmalābha - 'obtaining dharma'. Dhanyā, a poor widow, does her best to bring up her son, Sangama. The child works as a shepherd while his mother sells milk. On a festival day, he notices that rice made with sugar and milk - a treat - is being prepared at others’ houses and asks his mother if he can have some milk-rice too. She cannot provide any, but neighbouring women come to her rescue. When the boy is about to eat, a Jain monk happens to come to the house, begging alms to break a month’s fast. Sangama sees this as an unexpected opportunity and offers the whole dish to him with joy and devotion. When his mother comes back and sees the dish empty, she serves him more food. Sangama dies the same night. 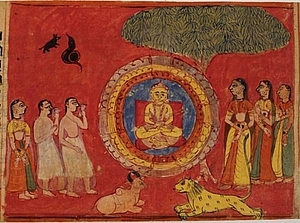 Sangama's rebirth as Śālibhadra is illustrated in an 18th-century manuscript of the 'Dhanna-Śālibhadra-carita'. Sangama's virtuous behaviour leads him to be reborn as Śālibhadra, son of the wealthy merchant Gobhadra and his wife Bhadrā. Rājagr̥ha is the capital city of King Śreṇika, who rules with his son and minister Abhayakumāra. The rich merchant Gobhadra and his wife Bhadrā also live there. Sangama is reborn as their son, Śālibhadra. His name comes from the dream his mother has while pregnant, in which she saw a field of ripe rice - śāli. In due course, this beautiful young boy is married to 32 wives. Gobhadra decides to turn to ascetic life, later on fasts to death and then is reborn as a god. As a god, he continuously helps his son by showering him with immense wealth. One day, merchants come to the king’s palace, offering him exquisite shawls for a high price. He refuses so they go to Śālibhadra’s house, where his mother buys them and gives them to her daughters-in-law. When the king happens to hear this, he sends an envoy to Bhadrā’s house to buy the shawls, but learns that they are no longer available. He is amazed at what the wealth of Śālibhadra must be, greater than his own. Highly intrigued, the king calls the boy to his palace, but the mother comes instead, saying that her son never leaves the house, and invites the king to visit them. He accepts and is received with great pomp. King Śreṇika shows his favour to Śālibhadra, by clasping him, in this illustration from a manuscript of the 'Dhanna-Śālibhadra-carita'. The people around rejoice at this mark of royal approval. But Śālibhadra has realised the emptiness of material power. 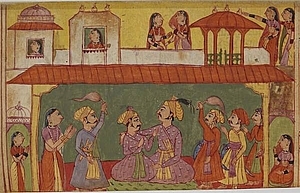 Bhadrā informs her son that the king has arrived, according to the versions implying or stating that he is an important person who should be respected. This makes Śālibhadra reflect on what a real king would be and what real power is. This causes him to become aware of what being in the world requires and how it implies accepting subordination. Yet he comes to pay his respects to King Śreṇika, as his mother wishes. However, when the king touches him, Śālibhadra, whose body is extremely tender, cannot bear his contact and, according to some versions, bursts into tears. The king returns to his palace, after having been sumptuously entertained by Bhadrā. After listening to the Jain monk Dharmaghoṣa preaching, the young boy is determined to become a monk. However, his mother strongly opposes his decision so Śālibhadra decides to wait. But he renounces his wives one after the other. This manuscript illustration shows Subhadrā holding her husband's feet to stop him leaving his family responsibilities to become a monk. The women are Dhanya's wives, who are all unhappy with his decision. Śālibhadra’s sister, Subhadrā, is sad at the thought that her brother intends to renounce worldly life stage by stage. She shows her sadness in front of her husband Dhanya. Dhanya thinks that there is no reason to postpone anything good. Subhadrā and his seven other wives mock him as a teacher who does not put his teaching into practice. He takes them at their word and decides to turn to ascetic life. His wives try to prevent him, but are unable to do so. They also decide to become mendicants. This manuscript painting depicts the 24th Jina Mahāvīra and the 'universal gathering' - samavasaraṇa. This Sanskrit term means the event during which the omniscient Jina preaches to all sentient beings - human beings, animals and deities. It also describes the special building from which the Jina delivers his sermon, built by the gods. This has doors in the four directions so his message spreads to all corners of the earth. During the universal gathering natural enemies are at peace, demonstrated by the pairs of animals. Mahāvīra happens to preach in Rājagr̥ha. While attending the sermon, Śālibhadra sees that his sister and brother-in-law have become ascetics and is strengthened in his decision. He takes monastic vows, leaving his mother and wives in sorrow. Dhanya and Śālibhadra lead the life of perfect ascetics, in particular observing various fasts. One day Mahāvīra announces that they will break their month’s fast at the hands of Śālibhadra’s mother. The monks go to Bhadrā’s house, but nobody attends to their needs. Outside the city, they meet a milk-woman, who is overcome with joy when she sees them. She offers them alms. It so happens that this lady is Śālibhadra’s mother in his previous birth as Sangama. Encouraged by Mahāvīra, both Dhanya and Śālibhadra reflect upon their earlier lives, then undertake the ritual of fasting unto death. When she learns about the condition of her son, Bhadrā is again grief-stricken. The two ascetics are reborn as supreme gods in the heaven called Sarvārtha-siddhi, where they enjoy the highest bliss. The Story of Śālibhadra has been extremely popular for centuries among Śvetāmbaras and there are many variations of the tale. The story has changed focus and developed over time. Some versions revolve around one particular character, while separate tales elaborating the life of Dhanya have also arisen. Individual episodes in the outline above have often been treated as separate tales and may occur in collections of stories to illustrate certain Jain beliefs. With the passage of time, however, the whole story summarised above has become more common. Both famous monks, who were leading intellectual authorities in their time, and anonymous writers have reworked the tale over almost two thousand years. There are scores of versions, in prose and verse, taking a variety of literary forms. The Story of Śālibhadra is often known as the Dhanya-Śālibhadra Story, because Dhanya is a key figure and the destinies of both characters are linked together in the later stages of the story. There are also accounts of Dhanya's life before he marries Śālibhadra’s sister and thereby becomes his brother-in-law. One example is the Dhanya-vilāsa by Kalyāṇa kavi, composed in 1624 CE (Bender 1992: 7). 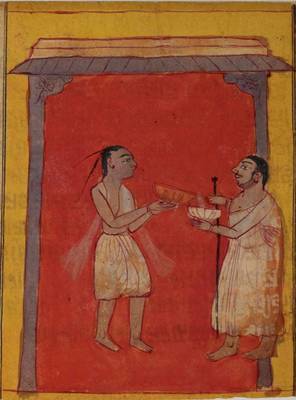 This painting from an 18th-century manuscript telling the story of Śālibhadra shows a monk being given milk-rice. After Sangama's poor widowed mother makes the milk-rice he has requested, the boy happily donates the delicacy to a monk seeking alms. Early versions of the stories are found in works that are peripheral to the canonical scriptures. These are not eventful or sentimental as they tend to become later and do not contain all the episodes outlined above. Instead they focus on a single key concept. This may be offering alms, fasting to death or renunciation of material wealth. The Āvaśyaka commentaries include the paradigmatic episode of the poor boy who is about to eat a delicious dish but offers it to a Jain monk instead. Here the character is named Kr̥tapuṇya - the name Śālibhadra does not occur in this context. The incident is meant to illustrate the concept of alms-giving - dāna - and is reused in many stories, which may feature characters of different names. In some cases the story is meant to illustrate the concept of fasting unto death, and is then restricted to the final part. This happens in the Maraṇa-samāhi. This text is one of the Prakīrṇakas, a category of texts specialising in this topic. In this work Dhanya and Śālibhadra are highly praised as two monks who perfectly observed this practice on Mount Vaibhāra. In another didactic text, the Uvaesamālā, Śālibhadra is singled out because, even though he is immensely rich, he has no more desire for worldly wealth. He realises that being a lord or powerful person does not mean being a king in the material sense. In this detail of a manuscript painting, King Śreṇika is on his way to Śālibhadra's house. 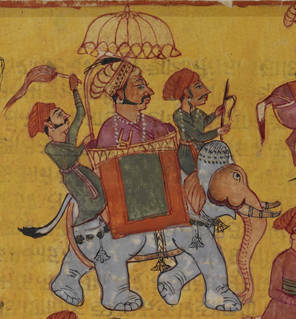 His wealth and power are stressed by his colourful howdah and richly caparisoned elephant, while his status is symbolised by the parasol and servant who fans him. The story in its full form is found either as an independent tale or in collections. When these story collections are thematically arranged, the Śālibhadra tale occurs in the sections devoted to giving alms to monks - dāna. This is because giving alms is the fundamental principle it is meant to demonstrate, as in the Mūlaśuddhi-prakaraṇa or Ākhyānaka-maṇi-kośa. This concept is so closely associated with this story that one of the versions mentioned below is also known under the title Wishing Tree of Alms-Giving - Dāna-kalpa-druma - which means the 'best story about giving alms'. King Śreṇika, a contemporary of Mahāvīra, is a figure in the story of Mahāvīra’s presence in the later phase of the story, when Dhanya and Śālibhadra are presented as monks who wander with him. It would be irrelevant and almost impossible to give an exhaustive list of all versions of the story of Śālibhadra. The table includes a representative selection. More are mentioned in Shah 1983 (pages 22 to 37), coming to a total of 50. Of these, nine are in Sanskrit and 41 in Gujarati, with several of them undated. The version of the Story of Śālibhadra by Matisāra is known by the title Dhanna-Śālibhadra-carita or Dhanna-Śālibhadra-copaī. Composed in Old Gujarati, Matisāra's 17th-century verse version of the tale is well known among Śvetāmbara Jains. As is often the case with Gujarati narrative poems, information on the date of composition and author is found at the end of the work. The story is divided into sections associated with musical modes - rāga - which is usual in Gujarati verse of this period. The tale includes all the episodes associated with the full story. The personalities of the story's characters come through strongly in this spirited version, which has been published several times in India. A scholarly treatment in English appeared in 1992. On JAINpedia, the story of Śālibhadra is found in a manuscript held in the British Library in London and is one of the highlights of JAINpedia. The 24th Jina Mahāvīra at the beginning of an 18th-century manuscript of the Śālibhadra story. The Jinas are commonly invoked at the start of a Jain manuscript, to bring good luck. This illustration presents Mahāvīra as a spiritual monarch. The beginning and end of the text emphasise the concept of giving alms, while the story is divided into 29 sections called ḍhālas, each having approximately 35 to 40 stanzas. Each section is associated with a musical mode - rāga - in accordance with the rules of composition in Gujarati poetry. Each section ends with a stanza written in a metre different from the rest, a couplet known as dūhā. Śālibhadra obtained happiness and prosperity through alms-giving. By relating his story one drives sins far away. Pay close attention to the tale of Dhanya which is combined with it. The text covers all the episodes described in the plot outline above, summarised in the table. A man can obtain two merits by undertaking saṃyama [self-control]: he becomes an eternal king in the next existence, and, in this existence, he has no king over him. Thus two goals are gained by one path. They confessed and repented with mind, word and body whatever pains they had caused in connection with their practice of Saṃyama [= self-control], and he censured them at that time. They asked forgiveness of the 8,400,000 classes of existence and declared their friendship for all of them. With purified minds, they reverenced all the Jinas, the teachers in proper conduct [Dharmācāryas] and the Lord [Mahā]Vīra, especially. They undertook the Vrata to starve until death while standing like a tree [in a motionless meditation posture] and abandoned their lovely, desirable bodies to this. They resorted to the four wise refuges [= the Arhats, the Siddhas, the Sādhus and the dharma told by the Omniscient] and released themselves from selfishness. The story contains many monologues and dialogues and is told in a lively style. Although it includes a number of clichés, it is full of spontaneity in the way the various protagonists express their feelings or wishes. Outbursts of emotion are frequent in this version. Śālibhadra’s mother, Bhadrā, appears as a determined character who entirely runs her son’s life. Until he turns to monastic life, he seems a dominated and fragile child - although he is depicted as married to 32 wives. His brother-in-law is called by his Gujarati name, Dhannā, although Śālibhadra has the Sanskrit version of his name. Matisāra's version is quite popular and has been published in India several times. It has also been the subject of a critical edition, English translation and grammatical analysis by the American scholar Ernest Bender (1919–1996), which was published in 1992 in the American Oriental Society Series. The story of Śālibhadra is represented on this website by the British Library manuscript Or. 13524, which has been fully digitised and is one of the highlights of JAINpedia. This manuscript is particularly interesting because of its 44 colourful paintings and the final colophons, which provide a lot of information. It was produced in the Jaisalmer fortress, in Rajasthan, in 1726 CE (1783 of the Vikrama era). The colophon shows some rare characteristics, in that it is unusually detailed and stresses the visual aspect of the manuscript. At a minimum, colophons provide the names of the monk who instigated the copying of the text and of the scribe and the recipient, but here the names of all those involved in the production of the manuscript are mentioned. As is often the case in Gujarati works, the poem ends with verses giving information on the time of composition and on the author. The author gives the date, following the usual system of the Indian calendar, as the sixth day of the dark half of the month Āśo in the year 1678 of the Vikrama era, equivalent to mid-September to mid-October 1621 CE. The date this particular manuscript was copied is supplied in the manuscript colophon. The name of the author is most frequently written as Matisāra, as it is in this manuscript held in the British Library. There is also a less common variant form, Matisāgara, found in some manuscripts of the work. Matisāra was a disciple of Jinasiṃha-sūri, and composed this work in accordance with the instructions of Jinarāja-sūri. This is Jinarāja II, who was head of the Kharatara-gaccha sect and flourished from 1618 to 1642. In addition, the colophon puts particular emphasis on the visual aspect of the manuscript. First, it explicitly states that it is meant to be not only read, but also seen. Secondly, the painter’s name is given, which is unusual. Finally, this painter, Kanakakīrti, is clearly a monk, indicated by the term muni attached to his name. This lively illustration from an 18th-century manuscript shows life in the city of Rājagr̥ha. The ladies in a pavilion, the musician and the man on an elephant hint at the exuberance, while the crowds and buildings indicate the city's size and wealth. 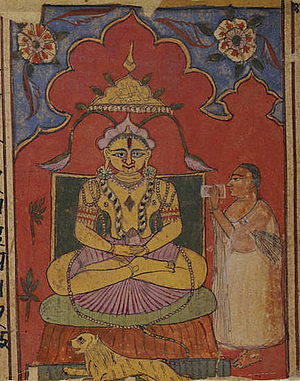 The story of Śālibhadra is one of the most important sources for Jain illustrated manuscripts created by the Śvetāmbaras. Practically all versions of the tale can give birth to visuals, but it seems that Matisāra's version is among the most commonly illustrated. There are plenty of examples of manuscripts of the Story of Śālibhadra, most of which date back to the 17th century onwards and were produced in Gujarat or in Rajasthan. The illustration styles in the manuscripts are extremely varied but are generally notable for their liveliness and freshness. Unlike much Jain art, paintings in the Story of Śālibhadra are not tied to standard scenes and artistic conventions. It is popular among all Śvetāmbara Jains, but the Sthānaka-vāsins seem to greatly favour it, perhaps because the lack of temples and worship of images in the text supports their views on these matters. Indeed, some of the surviving manuscripts feature illustrations of Sthānaka-vāsin mendicants. The paintings in the JAINpedia manuscript, however, point to the Mūrti-pūjaka Śvetāmbaras. This British Library manuscript has so many illustrations that they form an almost continuous pictorial version of the story, serving as much more than simple accompaniment to the writing. It is virtually impossible to list all the painted manuscripts of versions of the Śālibhadra story, as they are available in such large numbers. In some remarkable cases, the painter’s name is given. This table gives a selection, as noted in secondary literature. In the e-Library, plate ZC is on page 89, and figures 83 to 86 are on pages 123 to 124. In the e-Library, the description is on page 159. The manuscript paintings of the Śālibhadra story are generally very attractive, as they are colourful and lively. Unlike the Kalpa-sūtra paintings, the illustrations of the Uttarādhyayana-sūtra or the art portraying the Jain universe, for instance, they are not formalised or standardised. They show a certain amount of freedom in the variety of scenes depicted and in the way they are executed, demonstrating many details of daily life. There is scope to show a wide range of individuals, from the courtly elite to ordinary people, and to represent both interior scenes and natural landscapes. There is a wide range of styles found in Śālibhadra manuscripts, ranging from Mughal to Rajasthani. 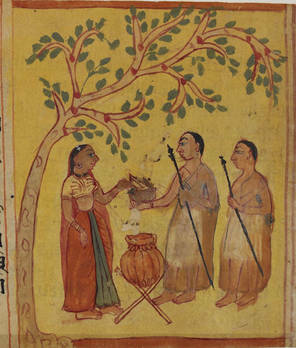 This manuscript painting of Matisāra's version of the Śālibhadra story shows the two monks Dhanya and Śālibhadra accepting alms from a milk-woman. Their white robes and wooden staffs indicate they belong to the Śvetāmbara Mūrti-pūjaka sect. The Story of Śālibhadra is recognised as one of the tales that has been adopted by the sect of the Sthānaka-vāsins, ‘as no reference to temple or image worship is found in it’ (Nahar 1976: 6). The Boston Museum manuscript (Coomaraswamy 1924 / 2003: folio 23 on Plate XXVII; folios 33 to 35 on Plate XXIX) distinctly shows this sectarian affiliation, as the Jain monks in the story are depicted wearing white mouth-cloths. This mouth-cloth is typical of Sthānaka-vāsin monastic equipment. Mouth-cloths also appear in one manuscript in the Prince of Wales Museum, where they are painted in silver (Bender 1983: 278). Even so, the British Library manuscript clearly has a Śvetāmbara Mūrti-pūjaka affiliation, with Dhanya and Śālibhadra shown carrying the monastic staff. Sthānaka-vāsin mendicants do not have this item of monastic equipment. As shown in the table listing major illustrated manuscripts of the Story of Śālibhadra, the number of artworks in individual manuscripts is often high. This has the effect of the sequence of images forming a continuous visual narrative that parallels the story in the text. The captions, often found at the side of the pictures, emphasise this effect. This is the case in the British Library manuscript on JAINpedia, which is detailed here. The opening invocation to the 24th Jina Mahāvīra is translated into a painting showing him in the lotus position of meditation - padmāsana. His emblem, the lion, is sitting in front of him, while a monk pays him homage. 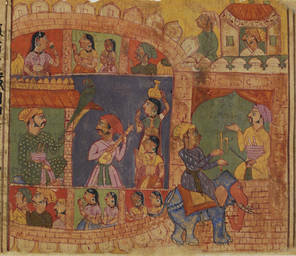 Ladies in a pavilion, a musician and a man on an elephant are visual depictions of the exuberant atmosphere of Rājagr̥ha. The poor widow Dhannā takes her son to Rājagr̥ha, a city of hope for them. The boy Sangama looks after a herd of cows to earn a few coins. When a festival day comes and the little boy sees others enjoying milk-rice, he asks his mother for some. She is unable to satisfy his wish so she is heart-broken. Four ladies come to Dhannā, asking why she is unhappy. They bring ingredients for milk-rice. The boy pours the milk-rice into the begging bowl of a Jain monk who has arrived just as he was about to eat the delicious dish. The monk is shown holding the wooden staff typical of Śvetāmbara Mūrti-pūjak mendicants. The merchant Gobhadra and his wife Bhadrā are shown in their house. 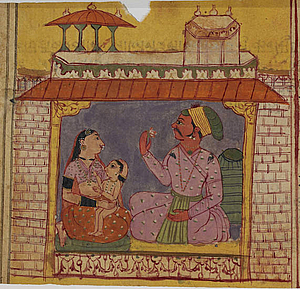 The lady is holding the child, Śālibhadra, on her lap. A well-dressed man sits in a large house, watching three ladies on his left. Three other women are busy fanning him. This is Śālibhadra and some of his wives. Bhadrā is bargaining with a man, while two others talk outside. They are the merchants who have come to her house to try and sell their expensive shawls, which are too costly for everyone else, even King Śreṇika. Having heard that Bhadrā has bought the shawls, the king sends an envoy to her house for a shawl. Bhadrā explains that she is not in a position to give him any shawls, since they have been given to her daughters-in-law, who have spoiled them. So the servant returns empty-handed. The king, intrigued and envious, sends his minister and son Abhayakumāra to Bhadrā's house to fetch Śālibhadra. Bhadrā kneels in front of Śreṇika and touches his knees in a humble attitude. She asks him to visit Śālibhadra's house, arguing that her son is too fragile to go out. Finally King Śreṇika, mounted on an elephant, departs for Śālibhadra's house. He is accompanied by soldiers on horseback, camel and foot. Śreṇika and his entourage are shown round the house. The king is amazed by the beauty of the first floor - a life of ease in various small pavilions symbolises the luxurious atmosphere in Bhadrā’s house. When Śreṇika is shown the second floor of the house, he is even more astonished. And he is staggered by the sumptuous third floor. Meanwhile, Śālibhadra is in his private apartments, reclining on a couch and enjoying the company of his wives. His mother arrives to bring him to the king. Śālibhadra complies with his mother’s wish and comes to see the king, accompanied by his wives. The king shows his favour to the young man. Everyone present rejoices, except Śālibhadra himself. After meeting the king, Śālibhadra is thoroughly dejected, reflecting on what being a king really means. Even the company of his wives does not cheer him up. Bhadrā tries to soothe her son, who has decided that he should give up everything. A woodsman arrives at the house and reports that a Jain monk has come. Śālibhadra, happy of this opportunity, goes to pay his respects to the monk. The mendicant sits on a raised seat - āsana - in a park with trees where monkeys and peacocks are playing. Śālibhadra asks his mother to grant him permission to leave worldly life. Bhadrā tries to persuade her son not to do this and finally refuses his request, asking for a delay. Śālibhadra decides to leave his 32 wives one after the other. When the fourth wife realises that her turn will come the next day and that her husband will leave her at the end of the fourth part of the night, she climbs on the roof of the house. The caption says ‘the fourth wife marks the tigers’, referring to a phrase in the text. In many illustrations of this episode, the moon is pictured with four tigers, representing the four parts of the night. Here, however, four women hold each other's hands while a man sits before five other ladies. 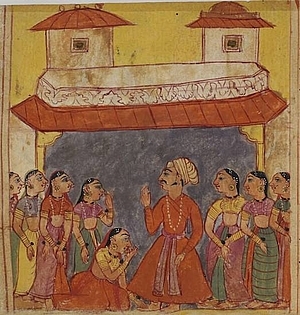 This is probably to be interpreted as a depiction of the whole episode of Śālibhadra's leaving his wives. While Subhadrā is bathing her husband, Dhanya, she begins to weep, knowing her brother's wish to give up the life of a householder. In vain Subhadrā tries to dissuade her husband from taking mendicant vows. She grips Dhanya's sash to stop him from leaving. Subhadrā holds her husband's feet to keep him at home. These three successive scenes, all on the same theme, form a visual accumulation, which is a way to translate the long and lively dialogue between Subhadrā and her husband in the text. Dhanya tries to persuade his wives that he is right in wishing to renounce worldly life. He goes to Śālibhadra to tell him that his decision to give up worldly life is right and that he should continue with his plan. Dhanya is carried on a palanquin and wants to take the vows. Śālibhadra again asks his mother's permission to become a monk. She finally agrees. Śālibhadra is carried on a palanquin, preceded by musicians. This scene indicates he is on his way to perform dīkṣā - the ceremony of initiation into mendicancy. Now monks, Dhanya and Śālibhadra live a wandering life. It so happens that Mahāvīra comes to preach in Rājagr̥ha. He is shown here in the samavasaraṇa - universal assembly - with his emblem, the lion, sitting at his feet. A lion and a bull, and a mongoose and a snake represent the pairs of natural enemies at peace on this occasion. Two monks and a group of śrāvikās - lay women - symbolise the audience. Mahāvīra had told Dhanya and Śālibhadra that they would break their month's fast at the hands of Śālibhadra's mother. But when they reach the gate of Śālibhadra's former house, the doorkeeper does not recognise them and turns them away. This happens twice. A milk-woman is shown with a pot cooking on the fire. The pair meets her outside the city. She pours food into the bowl of one of the monks. 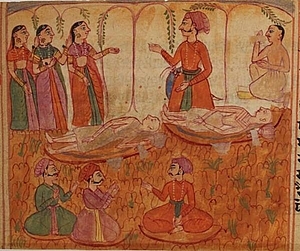 Dhanya and Śālibhadra are emaciated monks as they have begun the ritual of fasting unto death. Three women, representing Śālibhadra’s mother and wives, pay the monks their respects. Other lay men and a monk surround the fasting men to honour them. After death, Dhanya and Śālibhadra are reborn in the Sarvārtha-siddhi heaven. It is depicted through gods shown in various compartments and two banners - dhvajas. Later on the pair are reborn. They become monks, fast to death and ultimately reach the final liberation from rebirth, symbolised by their sitting in meditation in the white crescent. Thus, the text, the musical modes and the paintings ‘are worked together into a dynamic multi-dimensional presentation [...] inspiriting the progress of the narrative to its destined conclusion’ (Bender 1992: 18). There is evidence in modern Gujarat that such stories, if not precisely the one in this manuscript, were and are performed in public, accompanied by music. The colophon of the British Library manuscript on JAINpedia suggests that the paintings were meant to be seen. They were probably displayed in temples or meeting-halls when the story was retold orally. Today, the story of Śālibhadra is often staged in Gujarati or Hindi at community events, normally starring teenage amateur actors. Performing traditional tales is a way of transmitting the fundamental values of the faith among the diaspora. Such a play was one of the highlights of a celebration in 2009 of the Mahāvīr Jayantī festival in London.